Educational Magic is one of the most lucrative fields in magic. From school assembly shows to trade show floors, Doug Scheer has worked in every aspect Educational Magic for over three decades. Entertaining Education, The Comprehensive Guide to Creating & Performing Educational Magic reveals Doug's secrets to creating effective scripts, routines, and stories that will take your performances over the top. Included are downloadable videos of sixteen routines complete with the scripts that Doug uses to make an executive's income by performing in schools. You get all the tools you need to start creating your own routines. Plus, you'll discover how to prevent magic from being a distracting visual aid, the two different classifications of magic effects, and how and when to deliver a message successfully. The six elements of drama are discussed and analyzed so you can immediately get to work on improving your show, even if you're brand new to magic. Groundbreaking ideas are presented, complete with examples from Doug Scheer's eighteen-year career as an Educational Magician for one of the largest companies in America. 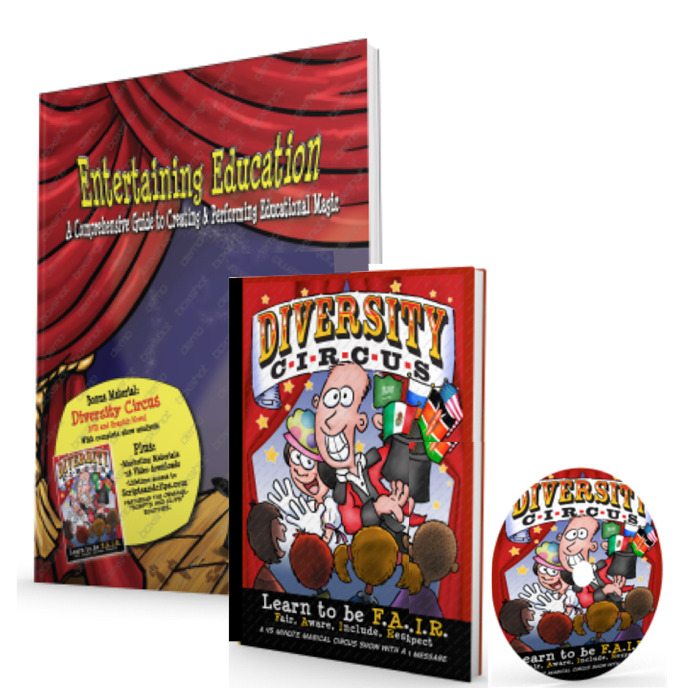 SPECIAL BONUS: Also included is the complete DVD and a graphic novel of Doug's highly praised school show, “Diversity Circus.” These provide an extensive behind-the-scenes analysis of every aspect of his show. If you're looking to do school shows that include an educational component, if you're looking to learn how to merge your magic with a message, this combo package of two books and a DVD will inspire, motivate and guide you to creating your own Educational Magic show.